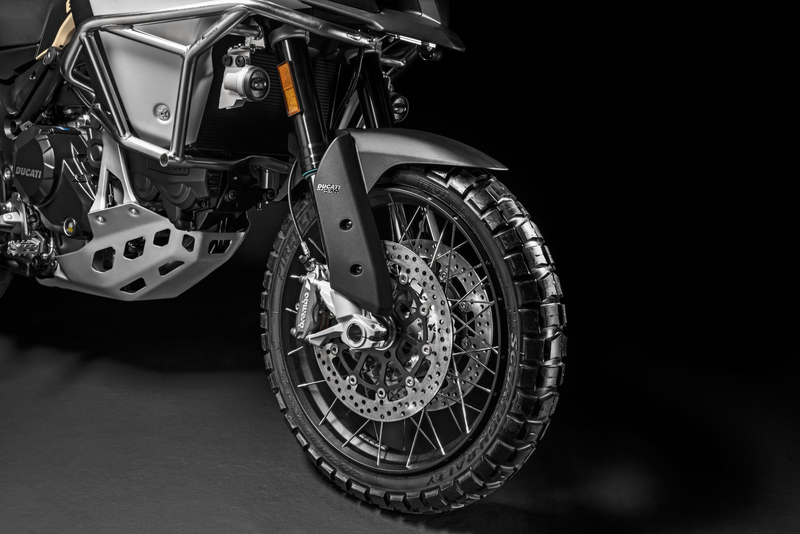  The Pro Edition of the Multistrada Enduro gets more off-road enhancements. Ducati has launched a new “Pro” version of their popular Multistrada 1200 Enduro. 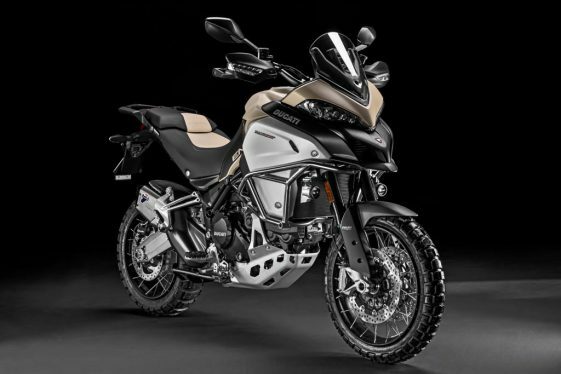 According to the Italian marquee, the newest iteration of the Multistrada 1200 Enduro is “designed for riders eager to get off-road and get exploring” and it is said to be Ducati’s attempt at competing with the recently released BMW R1200 GS Rallye model. The Multistrada 1200 Enduro Pro features a sand-color scheme, with rough surface finish, front end and tank cover. Other Enduro Pro exclusive features include the two-tone seat and the black subframe and clutch/alternator covers. The off-road spirit of the Pro version is further enhanced by Pirelli Scorpion Rally tires, fitted as standard: 120/70 R19 at the front, 170/60 R17 at the rear. 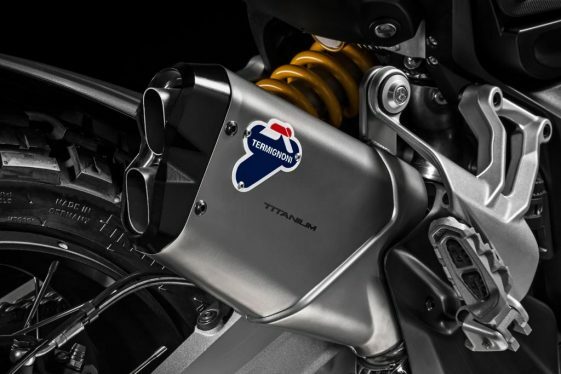 Other Pro features include Ducati Performance crash bars by Touratech with LED lights, a low screen (friendlier for on-the-pegs off-road riding) and the road-legal Ducati Performance exhaust by Termignoni. The new Pro version comes with a road legal Ducati Performance titanium exhaust by Termignoni (EU noise and emission compliant). The Enduro Pro features a sand color scheme, tubular steel tank bars by Touratech with supplementary LED lighting, and a shorter screen. Other exclusive styling features include the two-tone seat, the black sub-frame, and black engine case covers. Elsewhere, the Pro shares the same features as the Multistrada 1200 Enduro including the 30L tank, ultra-tough frame and the tried and tested 152 hp Ducati Testastretta DVT (Desmodromic Variable Timing) engine with EURO 4 type approval. Thanks to Riding Mode technology (Enduro, Touring, Sport and Urban), the Multistrada 1200 Enduro Pro offers that same four-bikes-in-one spirit that has made this versatile Ducati such a success. On the Multistrada 1200 Enduro Pro, ABS Cornering, Cornering Lights (DCL), Ducati TractionmControl (DTC), Ducati Wheelie Control (DWC) and the semi-active Ducati Skyhook Suspension (DSS) Evolution system with 7.9 inches (200mm) of wheel travel all come as standard, as does Vehicle Hold Control (VHC) for smooth uphill starts. The Pro version is fitted with Pirelli Scorpion Rally tires, sized 120/70 R19 in the front and 170/60 R17 in the rear. 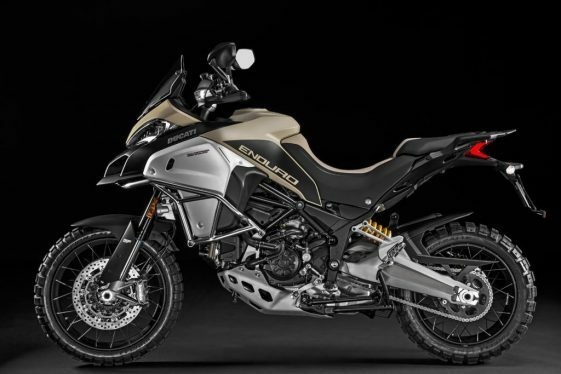 As standard features, the Enduro Pro also includes electronic speed control and the Bluetooth module; the latter, via the Ducati Multimedia System (DMS), lets riders connect the bike to a smartphone, manage key multimedia functions (incoming calls, text messaging, music) via the switchgears and display information on the TFT dashboard. The new Multistrada 1200 Enduro Pro will hit dealer floors in the UK in July starting at £18,995. 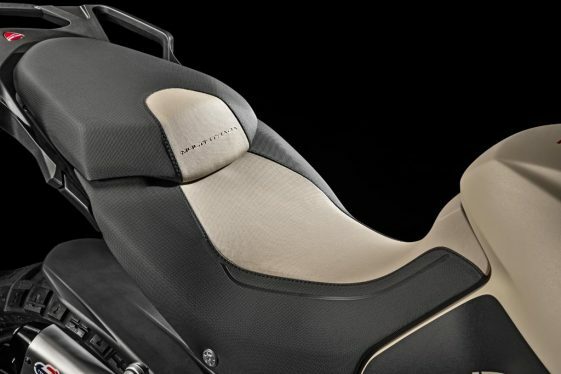 Ducati has also confirmed the new model will arrive to US shores in August. US pricing is TBD. Mid-Size is the new black. Have fun with those crash bars, you’re gonna need them taking this uber cycle off-road. Amazing colors, great design. Waiting to see what this one is capable of. Looked like some Africa Twin paint colors on the skid plate in that one shot. we now know what you saw. Now what did this “whale” weight? or does that not matter?